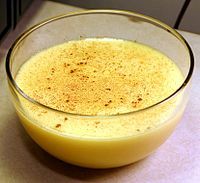 English: Custards include a range of preparations based on cooked milk and egg mixtures. Most commonly, custard refers to a dessert or dessert sauce, but custard bases are also used for quiches and other savoury foods. As a dessert, it is made from a combination of milk or cream, egg yolks, sugar, and vanilla. Sometimes flour, corn starch, or gelatin are also added. This page was last edited on 5 July 2018, at 13:32.